My journey back to Somalia, my home country, was a dream and a choice I always wanted to achieve. I wanted to live on the soil of my ancestors away from the congested refugee camps of Dadaab and far from the tall buildings of Nairobi that hosted me temporarily and offered me an opportunity to be a citizen in a second home where I grew up and studied peacefully. After almost two decades in Kenya, I finally decided to return to the country of my origin after getting an exciting opportunity to work with the Ministry of Education in order to bring hope to the next generation and give back my skills and knowledge to my community. I arrived at Aden Ade International Airport in Mogadishu on 26 July, a Friday morning. Almost all the passengers in the plane I was travelling in were Somalis, mostly returning from abroad. The small airport and its facilities were very busy and chaotic. It was far from international standards - with all the signs of the wreckage of war and unfinished reconstruction under way. I was driven by a colleague in a taxi through many checkpoints with heavily armed guards comprised of AMISOM [African Union Mission in Somalia] and Somali troops. We drove along the airport road, one of the city’s most dangerous, with heavily armed security personnel at frequent road blocks. There was a high security alert. I was extremely scared and could not believe my eyes. I thought they were clearing up the aftermath of a fight in the city, but little did I know that this was the order of the day in Mogadishu. That day was unique in particular because it was the 17th day of Ramadan, a day on which every year [militants] are known to carry out deadly attacks to commemorate one of the Islamic holy wars that took place on this day in history. We turned onto another highway that was also very scary for newcomers like me, but normal for local residents. It is Maka Al-Mukarama road, known for nearly non-stop hooting vehicles - mainly small shuttle buses with overloaded passengers, some hanging onto the doors and windows while the conductor clings to the rear side as he shouts for more passengers. 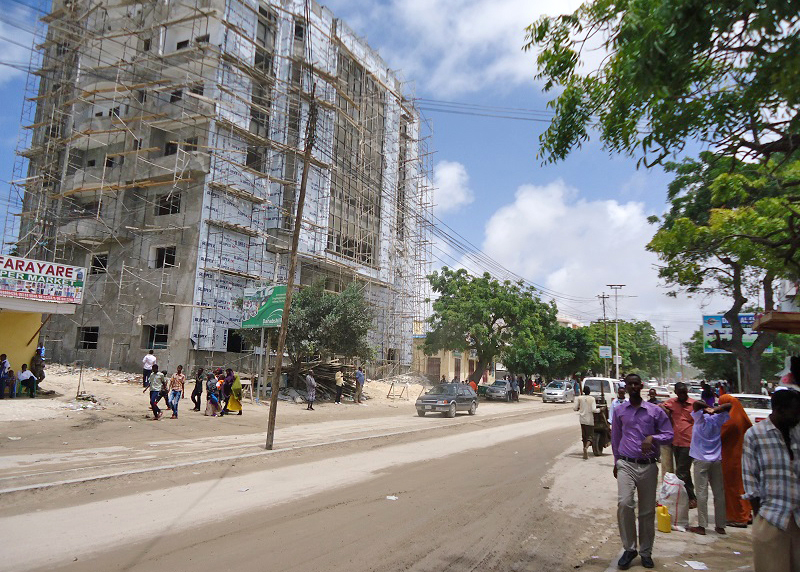 This road is also one of the busiest roads in Mogadishu; it directly connects State House and the airport. The traffic is hectic and it is controlled by traffic police, military and administration police. Gunshots, I was told, are used as “traffic lights” to disperse jams and as warning shots. Surprised at my anxiety and restlessness, the driver said: “My friend, stay calm, this is normal.” I smiled to respond positively but did not say a word. I was speechless until we reached Taleh residential area. This area was relatively calm. Residents were busy with their daily activities during the Ramadan fast. I stayed indoors on advice from family and friends in Kenya. I was told to minimize my movement in the city and avoid crowded areas. However, I felt very insecure even inside my room because I was traumatized by the deafening sound of gunshots outside. I hear gunshots all day, like I hear the call to prayer, and it makes me sick. I could not understand why there are all these gunshots in the streets. Then I recall the guys I saw along the airport road and the other young men in government uniforms hanging onto the sides of vehicles speeding up Maka Al Mukarama road all with firearms pointing at the pedestrians and other passing vehicles, their fingers on the trigger. The following day was another unpleasant experience. The Turkish embassy was attacked. I could hear the blast not far from where I was staying. The thought of going back to Kenya came to my mind but it eventually faded away later that night when the commotion ended and I saw the story on TV. Meanwhile, the locals are fully engaged in their day-to-day activities, indifferent to what is happening around them. Besides the gunshots, explosions and chaos, there are parallel constructions, business transactions and celebrations on the eve of the Eid festival after Ramadan. One of the most striking things I saw at this time were all types of big toy guns displayed in the shops for children to play with during the Eid celebrations [marking the end of Ramadan]. On the actual Eid day, I saw children smartly dressed happily enjoying the day but with huge toy guns hanging on their shoulders, shooting one another typically as though they were on a battlefield. When you see the toy guns you will never understand… I was really disappointed how these innocent children are being brought up with such destructive weapons. Is it because their parents are ignorant? What message does it portray? How will the fresh minds of these children be affected? What does it symbolize? I think we lost two generations already and the third one is growing in a world of lawlessness and ignorance. We have to do something about this and educate today’s parents and youth to save Somalia’s next generations. I reported to work the following week. I met new friends. The environment, the people and the job were all fresh and awesome. I felt very fortunate when I sat at a desk where the flag of Somalia flies right beside the computer, a reminder of my identity. I was motivated to be part of a young, passionate team mostly from the diaspora who came to work with the Ministry of Education. We are specifically designated to work on a unique programme that was independently run by the Ministry, unlike other partner-led projects. This was a project dubbed “Aada Dugsiyada” (Go to School Initiative) aimed at getting one million children into free and quality public schools by 2016. All the schools in the country are privately run so the challenge of starting the first free public schools after more than two decades of war lay ahead of us. However, the feedback from all the people - including stakeholders, donors, local media and authorities - is overwhelmingly positive. Running a whole government ministry that has not been functioning for over 20 years is a nightmare, and requires huge support both financially and in terms of dedicated professional human resources. I did not understand what “failed state” really meant until I reached Mogadishu. To be honest, I only thought the term was used just to describe how much our country was damaged, but the true picture dawned on me when I explored the capital, where all government institutions are managed. All the concerted efforts that were made to rebuild this country were focused on primarily handling the security, which still remains a stumbling block, thus leaving the gap for all other vital areas that a fully functioning nation with its dynamic society needs. But, interestingly, how do you describe those people who have been courageously living in the midst of all these clashes, the devastation, droughts, famine and atrocious terror situations for decades and counting - yet have been standing firm to keep going with privately run business institutions, booming markets, private schools, social and economic development, while those in diaspora have been supporting them financially doing odd jobs in odd hours and facing the challenge of detention, discrimination and death for the same course. I was really moved when I saw how the old Somali currency is being utilized in Mogadishu. In any business transaction, no one rejects the torn, ragged and spoilt ones because they fully know that there is no replacement or functioning central bank that regulates the money, so they are happy to keep going with what they have and make their lives easy. I am, therefore, pleased to say that the Somali community to which I belong is exceptionally resilient, productive, hardworking, courageous, intelligent and determined. These are people who can reach beyond measurable heights in the 21st century if only our own political leaders and their foreign stakeholders act honestly in all their endeavours to stabilize Somalia for a better tomorrow.